Be the first to share your favorite memory, photo or story of Alice "Sue". This memorial page is dedicated for family, friends and future generations to celebrate the life of their loved one. 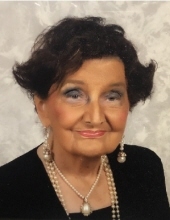 Mrs. Alice “Sue” Barker DeHart, age 93, of Olive Hill, Kentucky, passed away Sunday morning, March 24, 2019. She was born September 6, 1925, in Elliott County, Kentucky, a daughter of the late Dempsy and Ida Sparks Barker. Sue was a member of the First Baptist Church of Olive Hill and a graduate of Erie School, Morehead State University with a degree in Elementary Education, Masters degree and her Rank 1. She retired from the Carter County Board of Education as a teacher after 47 years service. She was a member of the Olive Hill Eastern Star Chapter # 290, the Red Hat Society, Historical Society and the Carter County Cruisers. Sue enjoyed shopping, reading and spending time with her family and friends, especially with her grandchildren. In addition to her parents, she was preceded in death by her husband of 64 years, Chester Lee “Fox” DeHart, and two sisters and three brothers-in-law, Ruth (James) Kinster, Clema (Jerry) Keller, and Tom Hodge, and one Goddaughter, Victoria Cartee. Sue is survived by her only son and daughter in-law, Greg and Debbie DeHart of Olive Hill, Kentucky; her only granddaughter, Amy Susan DeHart Russell (Wayne) of Olive Hill, Kentucky; two great grandchildren, Gabriel Wayne Russell and Addie Lee Russell; two sisters, Ruby Hodge of Ashland, Kentucky, and Virgie Barker of Mansfield, Ohio; and her special friends, Rita Lynn and Norma Cartee, both of Olive Hill, Kentucky. She also leaves numerous nieces, nephews, cousins, students, family, special friends and neighbors who will sadly miss her. Funeral services will be held at 3:30 p.m. Sunday, March 31, 2019, at the First Baptist Church of Olive Hill with Brother Mike Blankenship, her granddaugher, Amy Russell, and Brother Landon Copley officiating. Entombment will follow in the Jr. O.U.A.M. Cemetery in Olive Hill, Kentucky. Friends may visit from 1:30 p.m. to 3:30 p.m. Sunday, March 31, 2019, at the First Baptist Church of Olive Hill. Members of the First Baptist Church will serve as pallbearers. Globe Funeral Chapel in Olive Hill, Kentucky, is caring for all arrangements for Mrs. Alice “Sue” Barker DeHart. In lieu of flowers, the family request that donations be made to the First Baptist Church of Olive Hill Building Fund. "Email Address" would like to share the life celebration of Alice "Sue" Barker DeHart. Click on the "link" to go to share a favorite memory or leave a condolence message for the family.